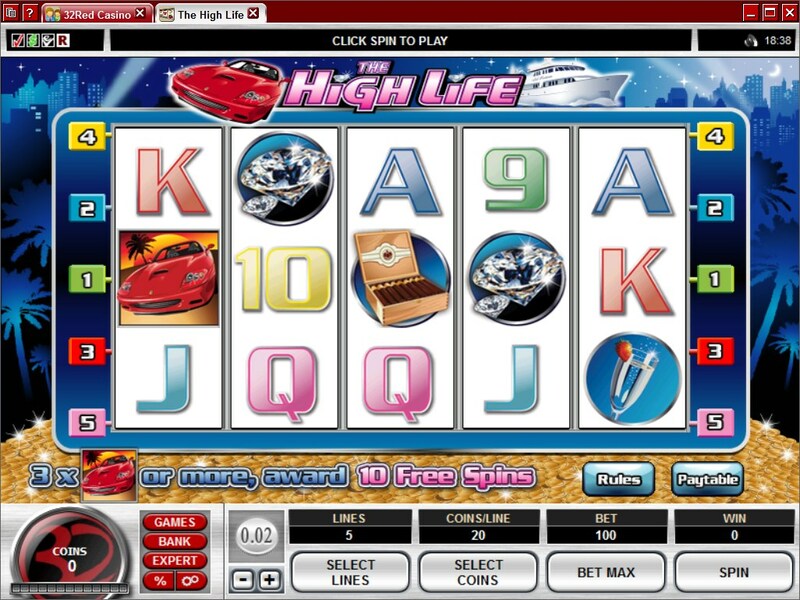 The High Life is yet another luxury themed slot, in this case a Microgaming title, but not the only one to come from them with this theme. It doesn’t feel as luxurious as it should’ve been, mostly because they skimped on the work and used plain looking playing cards for some of the symbols. The rest of the design has the right quality and look to it, so it’s a shame that they didn’t go all the way with it. 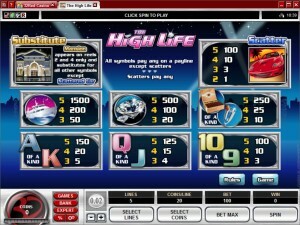 Though you have 5 reels in The High Life, you also get only 5 paylines for them. This makes it a more basic slot than I would’ve liked, but at least it has free spins, multipliers, scatters and wilds, so the features are OK. Top payouts go as high as $60,000. As features, you will encounter some very limited wilds, a scatter symbol and free spins which come with multipliers. The Mansion is the wild symbol and you will encounter it on two of the five reels, the 2nd and the 4th. With the exception of the scattered Car, all other icons can use the wild to create a combo. This is done whenever the wild appears on a line where there are a couple of matching icons already. The wild takes the same role as them and a combo of 3+ symbols can form. The other important part of The High Life’s feature list is the scattered Car. Featuring a red Ferrari, it can reward you by appearing in any random location, as long as you get at least two of them at the same time. The prizes vary from the initial 1x the bet which is given for two scatters, to the maximum of 100x which comes when you have all five. 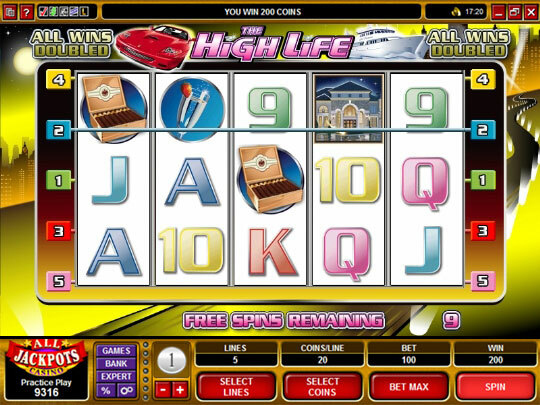 You’re also getting a round of free spins when you have 3 or more Cars scattered around the reels. 10 spins are given when this happens, with the wins obtained during the feature being all doubled. Retriggering the free spins is allowed. 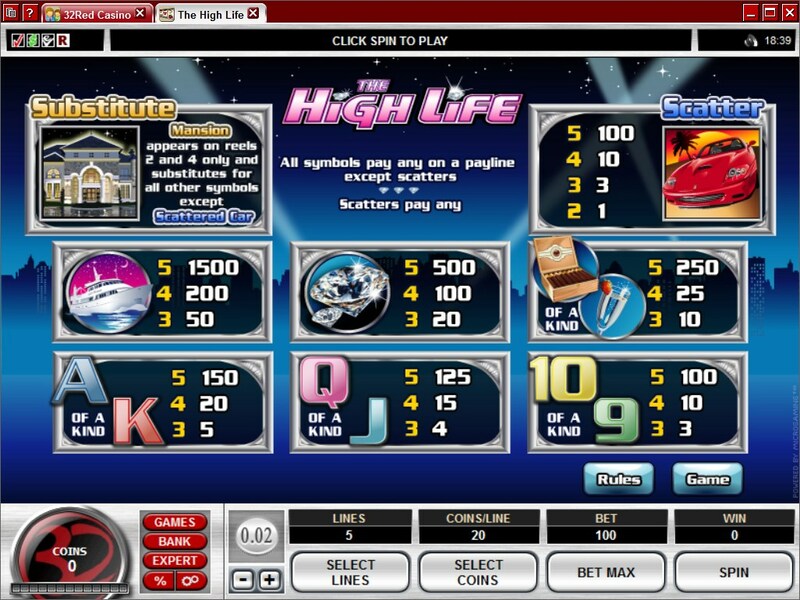 You can spend some serious money in The High Life, as it uses coins of up to $2 and as many as 20 of them can be selected for a single line. That $40 line bet can turn into a $200 maximum bet. The rewards seem big at first, since they give you $60,000, but that’s only a 1,500x line bet multiple. If you look only at the themed symbols, you’re going to find this a slot machine worthy of your attention and money. It has some very nicely designed images with things that money will buy for you, like expensive cigars, sports cars or diamonds, among other things. However, these aren’t the only symbols which were used. Playing cards are also there, and they’re of the basic variety, simple and without any theme to them. Symbols: Mansion (wild), Red Sports Car (100x bet, scatter), Yacht (1,500x), Diamond (500x), Cigars (250x), Champagne (250x), Ace (150x), King (150x), Queen (125x), Jack (125x), Ten (100x) and Nine (100x). Considering the 1,500x top jackpot, the basic wild symbols and the high wagers/low number of paylines, I’d say skip it. There are much better luxury themed titles out there, even from Microgaming some of them. 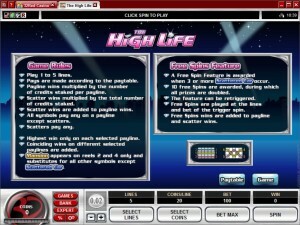 The High Life can be found at any Microgaming casino, where you get a chance to play it for real money or in free mode.